getcalc.com's Negative Binomial distribution calculator is an online statistics & probability tool to estimate combinations, probability of r number of failures in n number of finite repeated & independent trials. This calculator is featured to generate the complete work with steps which may helpful for beginners to know how to solve negative binomial probability or help grade school students to solve similar worksheet or homework problems efficiently. Negative Binomial Distribution also known as Pascal or Polya distribution, is a mathematical function or method used in the context of probability & statistics, represents the probability of total number of r failures in n number of finite & independent trials. In contrast to the binomial probability, here the failure probability for each trial is taken in to account to find the probability for r number of failures in the series of n events. It applies to statistical experiments such as tossing a coin or throwing a dice having equal probabilty for both success and failure for each independent trials. 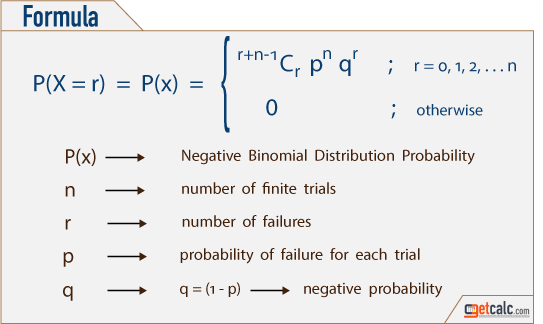 The total number of combinations is the integral part of negative binomial distribution to find the probability of r number of failures occur in n independent trials. The below are some of example problems with solutions generated by this calculator to help grade school students to solve similar negative Binomial probability worksheet problems effectively by just changing the input values.